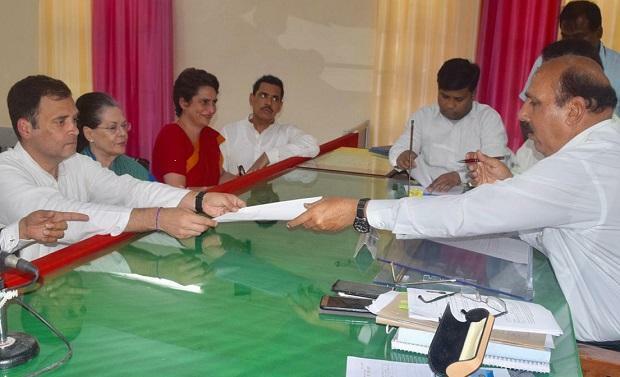 Congress President Rahul Gandhi on Wednesday filed his nomination papers for the Amethi Lok Sabha seat and also held a road show in the constituency. He was accompanied by UPA chairperson Sonia Gandhi and sister Priyanka Gandhi. Priyanka said the constituency was her father's "karmabhoomi" and its land was sacred for her family. Elections for 91 seats in 20 states and Union Territories will take place Thursday. The states and UTs are: Andhra and Arunachal Pradesh, Assam, Bihar, Chhattisgarh, Jammu and Kashmir, Maharashtra, Manipur, Meghalaya, Mizoram, Nagaland, Odisha, Sikkim, Telangana, Tripura, Uttar Pradesh, Uttarakhand, Bengal and 2 UTs. The campaigning for first phase ended on Tuesday with leaders putting their best foot forward to woo voters. The general election will take place in seven phases. The polling dates for national election 2019 are: April 11, April 18, April 23, April 29, May 6, May 12 and May 19. This election will choose the 17th Lok Sabha. Elections 2019 result will be announced on May 23.